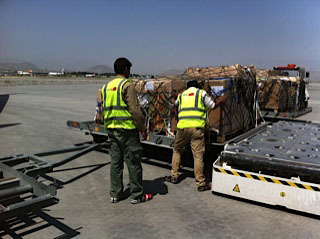 Move One has made over 4,500 perishable and frozen food deliveries for military and diplomatic missions in Afghanistan since 2005. Move One arranged air charters from the UAE, Netherlands, Sweden, and Germany and delivered more than 21 million kgs of FFV and frozen food items. Challenge: On-time delivery of temperature regulated food in support of military and diplomatic missions.